Many patients do not experience any symptoms during the early stages of glaucoma, including no pain and no vision loss. This makes it difficult for many patients to know if they have the disease. 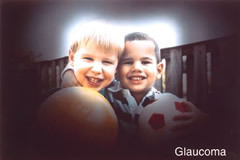 But as glaucoma progresses, patients may experience a loss of peripheral or side vision. Patients with Angle-closure glaucoma may develop sudden eye pain, headache, blurred vision or the appearance of halos around lights. While some patients may experience symptoms from glaucoma as the disease progresses, others do not learn they have the condition until they undergo a routine eye exam. There are several different exams performed to diagnose glaucoma, including a visual acuity test, tonometry (a measurement of the pressure in the eye), gonioscopy (a test to determine whether the angle is open or narrow), a visual field test, an optic nerve analysis, optic nerve photographs, and pachymetry (a measurement of the corneal thickness). Argon Laser Trabeculoplasty (ALT) or Selective Laser Trabeculoplasty (SLT) – For patients with primary open angle glaucoma (POAG). The trabecular passages are opened to increase fluid drainage. ALT is effective in about 75% of patients, and SLT may be repeated. » For more information on Glaucoma or to make an appointment, call us at either our Philadelphia office 215-627-1515 or our Ardmore office 610-649-7616.